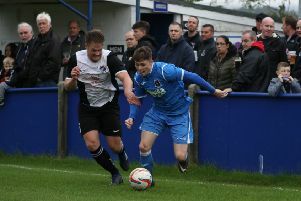 Liam Smith is predicting further growth at Padiham after his players portrayed a different side of their personality in victory over West Didsbury and Chorlton. The joint Storks boss watched in awe as his young squad dug deep, gritted their teeth and picked up three points with 10 men at the Ruby Civil Arena. Padiham are now eighth in the table having clocked up 13 points from eight games in the Hallmark Security Premier Division. “Under the circumstances the players showed a different side to them which we hadn’t seen before,” said Smith. “Now they look full of character. “They’ve come back in games before, so we knew they had that about them, but now they’re showing that they’re gutsy as well. “They stuck together as a group and took on board our instructions. They deserved three points. They created plenty of chances and got their rewards. “It’s always difficult when you’ve had a man sent off but we adapted very well to the situation. Substitute Jake Hargreaves scored the only goal of the game with a quarter-of-an-hour remaining to seal the deal following Alan Zuqoli’s first half dismissal. And the club’s first clean sheet of the season, to partner the winger’s winner, couldn’t have come at a better time. “Jake Hargreaves deserves the plaudits,” he said. “He was one of my key players last year. He picked up a nasty knee injury in pre-season and this was his first game back. “He’s worked hard to get back to where he needs to be. It was a huge positive for him and he deserved his winner. 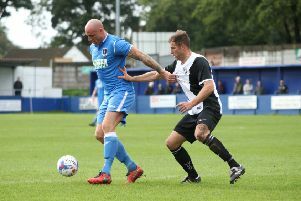 The Storks host Prestwich Heys in the second qualifying round of the Buildbase FA Vase tomorrow and Smith is hoping that consistency kicks in. After watching his opponents draw 1-1 with Nelson at Adie Moran Park midweek, Smith said: “Now it all boils down to consistency. We want a run in a cup competition. We were kicked out last year for fielding an ineligible player so we’d like to make amends for that. “It will be a tough test for us against Prestwich. I watched them against Nelson. Hopefully we can go on a bit of a run. “We haven’t played well for 90 minutes yet so I think we’re just going to get better and better. - Burnley United drew on a game-changing cameo from boss Paul Fildes to maintain their 100% start to the season on Saturday. United made it six wins from six at the top of the Storefirst East Lancashire League First Division with a 5-2 victory at Fishmoor Drive against Longshaw. It was another good performance from the side, who were without a number of key players, and Fildes made sure they claimed all three points, coming on at 3-2 for the last 15 minutes. On target were Kuda Chingwaro, Luke Riley, Micky White, Kev Tomlinson and Sameed Ellahi. United travel to the Heys Sports Complex tomorrow to face Oswaldtwistle St Mary’s. The reserves were also handsome winners, beating Peel Park 7-1 at Barden, as they made it two wins from two in the Second Division. They face a tough test tomorrow at home to local rivals Read United Reserves, who have won all five of their games to date. Then on Wednesday night, the reserves entertain Langho Reserves at Barden (kick-off 7 p.m.). Burnley Belvedere’s East Lancashire League side are at Read United’s first team in a First Division clash tomorrow. Kick-off is 2-15 p.m. in all East Lancashire League fixtures tomorrow. Meanwhile, Belvedere’s Lancashire Amateur League continued their excellent start to life in a new league. An impressive team performance saw the Greens win 4-0 at home to Rochdale St Clements. Goals came from Ell Riley, Micky Woodvine, Dale Goldsbrough and a 40-yard rocket from Aron Chapman. That win, coupled with a first defeat for Whitworth Valley, leaves Phil Ashton’s side three points off top spot with a game in hand. Belvedere are at home to Failsworth Dynamos Firsts tomorrow, kick-off 2-30 p.m. In the Mid Lancashire League Veterans Division, Belvedere’s over 35s earned a 5-0 win at home to Appleby Bridge. An own goal was added to by two goals from Mark Derbyshire, with Craig Bradshaw and Paul Fildes also on target.